Use the soft touch to get your message across with the Fabric Covered Bulletin Board! Children and adolescents are drawn to bulletin boards that have a little panache. They like soft background colors that do not distract from the messages posted on the bulletin board. The Fabric Covered Bulletin Board combines soft background colors with functional durability to create the most popular vinyl covered bulletin board on the market. We construct the Fabric Covered Bulletin Board with coated vinyl that resists the inevitable stains that come from drinks and dripping pipes. You only need a damp cloth and a quick swipe to clean the smooth surface. 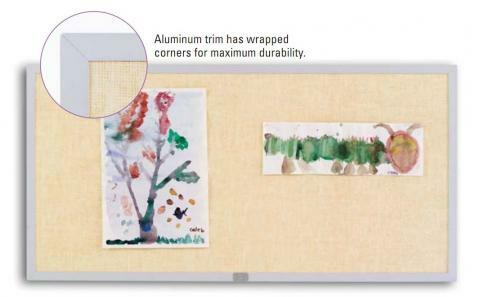 The satin anodized aluminum trim not only adds eye appeal to the Fabric Covered Bulletin Board, but the high-grade metal wraps around each corner to prevent the posting surface slipping out of place. Our mortise and tenon construction gives your school years of use. We offer 12 colors to seamlessly blend with posted artwork or important school notices. Get your message across using the soft approach!